Nimbuzz just released their new iPhone version of Nimbuzz which also supports 3G VoIP "dial up" calling and can turn the iPod touch into an iPhone. The old version was just released into the Apple iTunes store in November, so Nimbuzz is cranking out new version pretty quickly! The new version features a full dial-pad, and the ability to make VoIP calls to PSTN numbers using SkypeOut, as well as via their 10 VoIP partners including Gizmo5, Vyke, sipgate and A1 by leveraging SIP. You can now add individual buddies from AIM, Google Talk, Windows Live Messenger (MSN), MySpace, Yahoo!, and Nimbuzz. If Wi-Fi is unavailable you can make VoIP calls to Nimbuzz buddies using what Nimbuzz calls "Dial-Up VoIP", which is available in over 50 countries. Dial-Up VoIP simply means that Nimbuzz dials a local access number that your iPhone dials and then Nimbuzz's VoIP servers terminate the call. Jajah, and others have this feature as well. fring also has a good app for the iPhone. According to the Nimbuzz blog post, "We are experimenting with Twitter, and you can post to Twitter via the Personal Message feature! Try it. Your comments are always welcome, so please feel free to give feedback." Wow! Twitter integration with a VoIP app. Gotta love it! 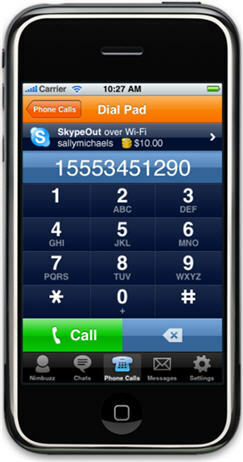 Nimbuzz just released their new iPhone version of Nimbuzz which also supports 3G VoIP \"dial up\" calling and can turn the iPod touch into an iPhone. The old version was just released into the Apple iTunes store in November, so Nimbuzz is cranking out new version pretty quickly! If Wi-Fi is unavailable you can make VoIP calls to Nimbuzz buddies using what Nimbuzz calls \"Dial-Up VoIP\", which is available in over 50 countries. According to the Nimbuzz blog post, \"We are experimenting with Twitter, and you can post to Twitter via the Personal Message feature! Try it. Your comments are always welcome, so please feel free to give feedback.\" Wow! Twitter integration with a VoIP app. Gotta love it!